One of the harder things about sewing machine repairs is removing the covers to get to the insides. The user manuals don't tell you how because they don't want you messing with the innards, while the repair manuals don't tell you how because they assume you already know how. This instructable is for the 1970s-80s Pfaff 1200 series free-arm sewing machines. It might work on other Pfaff machines; at least it gives you an idea of where they might hide the screws. I will also tell what parts are hidden behind each cover. Medium to largish straight-bladed screwdriver. If you spread a towel or fleece blanket on the work surface, small screws are less likely to bounce off the table. As you remove each cover plate, drop the screws into a ziplock bag and tape them to the plate. Use tuna to lure your assistant away from the work area. This cover has no screws. You have to remove this cover to remove some other covers. They overlap in a specific sequence. Rotate the spool holder into the sewing position. Grab the cover from the top between your thumbs and fingers, one hand at each end. Rotate the cover up and to the rear and it should come off. Lift the thread holder straight up to remove it. The "doughnut" rubber wheel of the bobbin winder. This is the cover you need to remove to change the light bulb. It is held on two pegs, with set screws keeping it on the pegs. TOOL NEEDED: small-bladed straight screwdriver with a long shaft. Remove the top cover as explained earlier. At the left (needle end) there are two holes. Insert the screwdriver and fiddle around until you have the screwdriver blade in the slot of the set screw. "Righty-tighty, Lefty-loosy" ... as if you were looking straight down on the screw's head. Turning the screwdriver to your left (counterclockwise) will loosen the set screw. CAUTION: Just loosen it, don't unscrew it all the way. If it falls out the bottom you unscrewed it too far. When the screws are loose, pull the front cover away from the machine. This is the cover you need to remove to mess with the drive belt tension, the motor and the power inputs. Pull the bottom of the motor cover slightly down and towards you to clear the hand wheel and remove the cover. The screws that hold the power input box to the frame. These are the covers you need to remove to replace the light switch push button, and mess with the power supply, the lower stitch mechanisms and the bobbin holder. Remove the top cover and the motor cover as explained earlier. Remove FIVE (5) screws, the 4 big ones and the smaller one hiding in the hole. NOTE: My machine is a free-arm. The bottom of a standard machine may be different. Remove the screw in the bottom of the free arm. NOTE: One or more of this series has a line of electrical connections outside the power box. Good luck. CAUTION: To remove the power input box, do not remove the screw on the bottom of the box. Things will fall out. Remove the two screws inside the motor cover plate (see the previous step) and push the box into the base of the machine. The light switch push button. Mr. Nimh, I appreciate your help. I thought my machine would be the same, but it has a different setup. 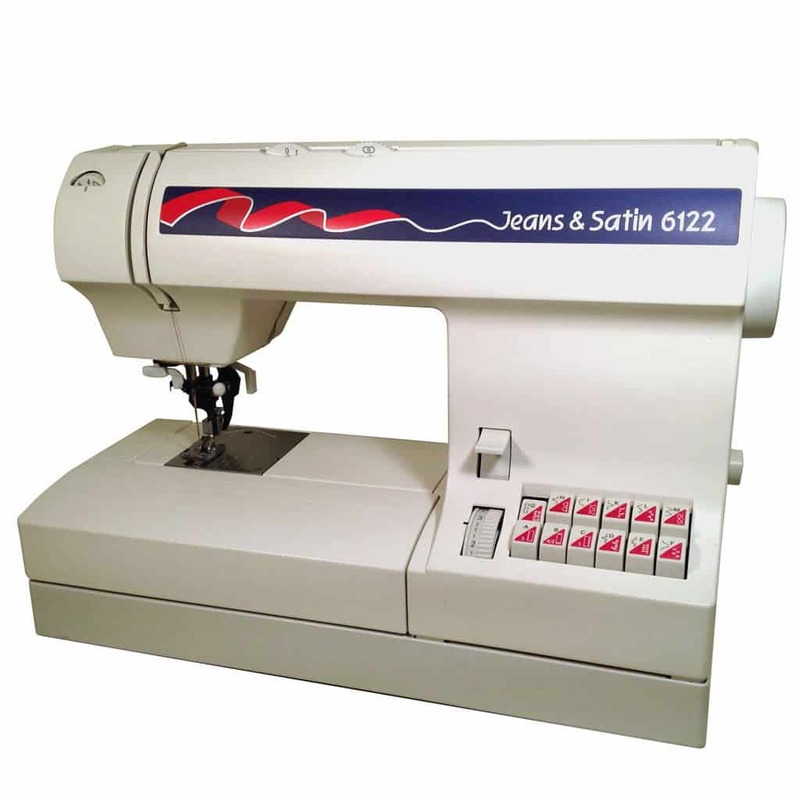 My machine is a Pfaff 6122 Jeans and Satin. If you have any information on this machine I sure would appreciate the help. I'm having trouble getting the front cover off. It is all one piece in the front and one piece on the back. There is a facebook group for older madhines - everything but Singer - that might be able to help. I've never messed with that one. See Step 2 - I added arrows pointing to where they hide. You need a small bladed screwdriver with a long shaft on it and just kinda poke around untikl you hit the set screrw. I have a Pfaff like this one and so was curious to read your instructable. I have wanted to get inside a few times but of course that is impossible - until now. But now it's a bit scary. Still I enjoyed reading all about it, thank you for sharing. What do you want to do in the machine? I made the other two instructables because I had repairs that had to be done. If there is something you want explained, maybe I can do it. I'm doing one now on tension adjustments, upper and lower. It is educational to take the top off, turn the handwheel and see what moves, change stitches and watch again. Put it in my favourite. I need to make for my Pfaff, not the same model but not very different. Thank you.